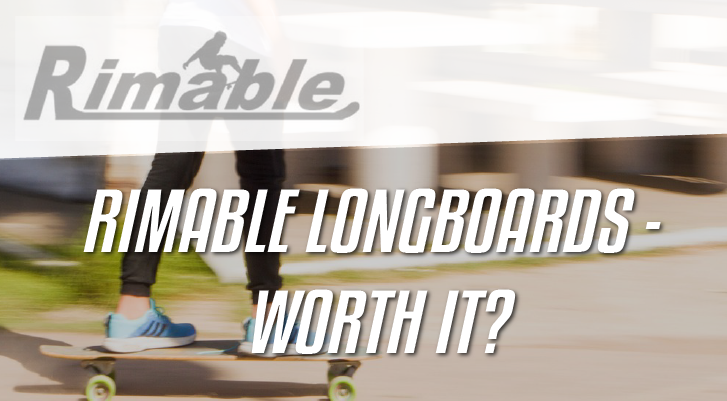 →Rimable Longboards Review – Are They Any Good? When I started skateboarding, I was flying blind. I only knew I wanted to skate. I saved up my allowance and bought a generic, off-the-shelf complete board. But I soon realized that I needed better gear, so I replaced it one piece at a time. I began with better wheels and bearings. They made a huge difference, as did new trucks. Eventually, I shelled out the money for a quality deck, and my first real complete was… complete. The boards in this Rimable longboard review would all do well in a similar situation. When you first decide to skate, you don’t know if skating’s for you (it is). Anyone who wants to simpy cruise around. Many beginners purchase cheaper boards like these as a gateway into longboarding, and there is absolutely nothing wrong with that. After you’ve been riding for a while and you get a feel for quality, you will likely decide to part with (or save up) more money for your next board. As an entryway, though, Rimable boards make sense. Let me explain. Rimable is a trademarked name belonging to Yongkang Ydream Fitness Equipment Co., Ltd. Based in China, this company makes more than just skateboards. In-line skates, scooters, fitness gear and toys are each a part of their product line. Therein lies one issue: Rimable is not a skateboarding-focused manufacturer. It has no website, and customer service is null. To see if that’s a problem, let’s dig a little deeper and examine some of the Rimable longboard options. The Rimable 22 is the company’s take (copy?) on a Penny board. It is a 22-inch-long, six-inch-wide plastic mini-cruiser. It has three-inch-wide trucks and nondescript polyurethane wheels with ABEC-7 bearings. These boards are semi-practical as transportation because of their portability, and some experienced skaters can even learn some tricks on them. The price of admission makes these boards an option for a beginning skateboarder. But being so small, there is little room to stand on one, making them difficult for even experienced riders to control. 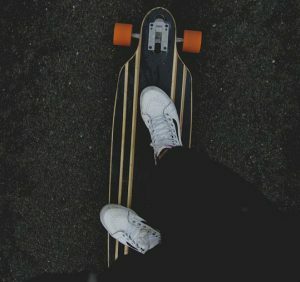 The Penny board has become a fashion statement, and the littlest Rimable is a fine and frugal alternative to the more expensive name brand. But if you’re looking to get into more technical longboarding, these relics of the 70s are not a real option. The pintail is a traditional shape in longboarding, inspired by surfboards and meant for cruising and carving. The Rimable Pintail longboard deck has nine plies of cold-pressed maple, and measures 41 inches long and 9.5 inches wide. It includes 7-inch, aluminum Rimable reverse-kingpin trucks (reverse kingpins reduce the likelihood of speed wobbles) and 70mm wheels with a durometer of 85A. The bearings are ABEC 11 which, rather than being a typical ABEC rating (ABEC ratings stop at nine), is actually a budget brand name. The Rimable bamboo pintail utilizes bamboo in the bottom layer of the deck to add flexibility, but everything else is the same. Both the all-maple Rimable Pintail and the bamboo model can be had on Amazon.com considerably cheaper than premium competitors. Both boards come with slick graphics applied, but they may not last if you abuse your board. The decks have a slight amount of concave, but are flatter and more cheaply made than premium alternatives like this Arbor pintail on Amazon.com. Check out this video review to get a live look at an Arbor and an idea of the features that the extra cash will get you. The Rimables will do the job and have you carving and slashing in no time, but longevity might be an issue if they are ridden hard. The Rimable drop-through, like all boards of this type, is designed to move at a faster clip than a pintail. It is 41 inches long and 9.5 inches long, with nine plies of maple. The 7-inch aluminum trucks pass through the board and mount on the top. This lowers the center of mass on the board, helping you skate faster while being more stable on downhill runs. The trucks, wheels and bearings are all the same as on the pintails. Another board option, which places the rider even closer to the pavement for stability on long-distance rides, is the Rimable drop deck. Both boards feature cutaways at the trucks to facilitate lean without risking the dreaded wheel bite. Drop-through longboards and drop decks are designed to go fast, and these Rimables are a budget option if you want to dip your toes in the downhill water. Compared to this Sector 9 on Amazon.com, the Rimable drop-through can be had for a fraction of the cost. However, you will get what you pay for. The Sector 9 is ready to bomb on arrival, while the Rimable (and its parts) will have a limited life span if ridden to extremes. What’s Good Abour Rimable Longboards? All the Rimable models make adequate entrances into longboarding. The nine-ply maple decks are solid and look good. The price point is attractive and makes it reasonable to consider trying out a board type that interests you without ponying up hundreds of dollars for what may become a room ornament. I have to tell you this. There are some fundamental differences between TOP tier (more expensive) and LOWER tier (cheaper) boards. Rimable graphics, though easy on the eyes, are still applied cheaply, and the trucks and wheels are lower-grade than premium options like Paris or Gullwing. I’ve heard people occasionally complain about quality control issues, though from what I’ve heard any factory errors are corrected by the seller. A swap out for a new component will likely fix the problem, but, however rare, this is an issue Rimable should address. If you’re just starting out and you’re not sure if you want to ride a skateboard (you do), then Rimable is a decent place to start. The components aren’t top shelf, but they will last while you learn to turn, and each can be upgraded. Just don’t be fooled by all of the various reviews that you can find online. All skateboards seem fast when you first start riding, and when someone refers to longboard wheels as “tires”, they’re obviously clueless. Rimables are, at best, a three- or four-star option, but one that will suffice for a beginning longboarder. In the end, the longboards in the Rimable lineup are what you would expect them to be. The entry-level prices are attractive, but if you continue to ride, your Rimable will outlive its usefulness. When that day comes, take a look around Heelside Chill to find the longboard that will keep you carving for years to come.